At The Villages in Florida, players have had the benefit of learning how to play from some of the best players in the country. They have tournamenst for the skilled players, they have clinics to help improve your game, they have beginner training schedules and ladder leagues, they have video night with Coach Mo, and they have the Pickleball Community Volunteer Group who have taken on the responsibility of enhancing the enjoyment of the game for all levels of play. On June 18-22, the Recreation Department hosted their first ability level 3.0-3.5 tournament at the Lake Miona Recreation Center courts. Participant registration exceeded expectations for the very first event. 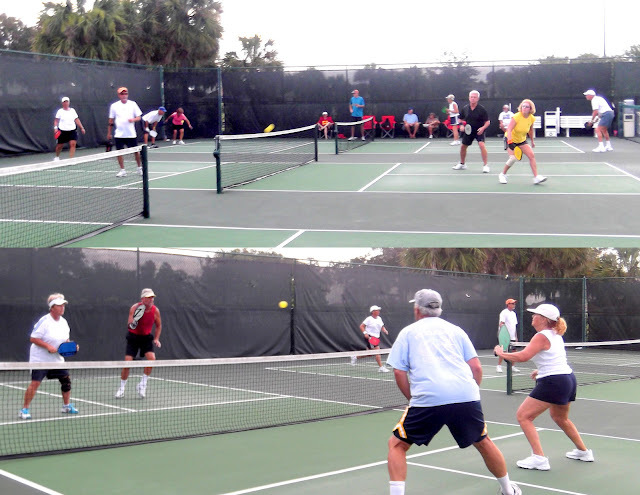 The single elimination tournament included doubles and mixed doubles competitions for Villages residents 50 years of age and older. Men's 3.5 Doubles Champions Dave Marchiselli & Gil Lee, Women's Doubles Champions, Cheryl Witte and Chris Leedy, Woman's 3.0 Doubles Champions Barbara Bailey & Madeline Ferraro and Mixed 3.5 Doubles Champions Velda Voelker & Bob Pentz. July will feature a round robin tournament for Beginner Level players. And for any player who wants to see if their rating has changed, or who is not sure how to rate themselves, periodic rating clinics are provided.